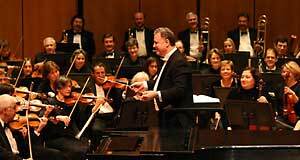 Music Director Lawrence Eckerling is entering his fifteenth season with the ESO. He continues to be committed to the on-going artistic growth of the Evanston Symphony and its talented musicians. He was named 2014 Illinois Conductor of the Year (Community Orchestras) by the Illinois Council of Orchestras, and he also received this accolade in 2007. Prior to his tenure with the Evanston Symphony, Eckerling served as Music Director and Conductor of the St. Cloud Symphony Orchestra in Minnesota from 1986 to 2002. Earlier, he served as Assistant Conductor of the Omaha Symphony, and as Music Director and Conductor of the Omaha Area Youth Orchestra. In 1980, he founded the Pro Musica Chamber Orchestra of Chicago, which performed a series of free Music Performance Trust Fund concerts. Born in Chicago, Eckerling grew up in Skokie and began his piano lessons when he was six in the Primary Piano Department at Northwestern University Music School. He earned his Bachelor’s degree in Music Education (in both instrumental and choral) at Indiana University, and completed his Masters in Orchestral and Opera Conducting from the same institution. 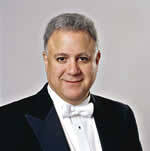 Eckerling is an active pianist, having performed as guest artist in Gershwin’s Rhapsody in Blue with the Mt. Prospect Community Band and the St. Cloud Symphony, and both conducts and takes the piano solo in that work in the CD “Evanston Symphony Live!” He performed regularly with the Chicago-based Duetri Ensemble and is also active in the jazz and pop fields, presenting live music from classical to rock and roll for private functions throughout the Chicago area. Eckerling is on the faculty of the Music Institute of Chicago, where he is Conductor of the Community Symphony and Quartet Strings. Maestro Eckerling makes his home in Glenview, Illinois with his wife, Sharon, and their son, Jeremy (when he’s home from college). Read more about Lawrence Eckerling at www.eckerlingconductor.com. Behind those black ties and black skirts are your friends and neighbors, your co-workers, your acquaintances. These are people you see in the community, perhaps on a daily basis, who volunteer their time to make beautiful music together as the Evanston Symphony Orchestra performing world-class music right here in Evanston. On five Sunday afternoons a season, they transform themselves from their chosen professions into talented musicians sharing their love of music with you, their audience. Learn how to join our orchestra here. The musicians listed below are scheduled to play in upcoming concerts. Click on any name to learn more about that musician.